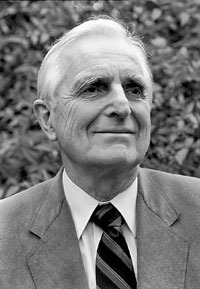 Computer pioneer Doug Engelbart was best known for inventing the computer mouse, and for his involvement in designing the earliest form of the Internet. He was raised on a farm, studied electrical engineering in college, and worked as a radar technician for the US Navy during World War II. By the early 1950s he was working for the National Advisory Committee for Aeronautics (the precursor of NASA), but his work involved little more than electrical wiring. Remembering how he had been inspired by a 1945 article in Atlantic Monthly, he re-read the article — Vannevar Bush's seminal "As We May Think" — and began wondering how to bring to reality the world envisioned in the article, where computers could be interactively connected in a network, and people could share and update information in "real time" instead of merely typing letters and attending meetings. He applied to the graduate program at the University of California at Berkeley, earned his doctorate, and briefly taught there before going to work for the Stanford Research Institute (SRI, now SRI International) in nearby Palo Alto, California. At SRI his lab developed hypermedia with an experimental groupware system called NLS (oNLine System). His 1962 paper, "Augmenting Human Intellect: A Conceptual Framework", has been called a "mission statement" for the early era of computers. In a demonstration at a meeting of computer developers in San Francisco on 9 December 1968, Engelbart began addressing the crowd with what seemed a science-fiction statement: "If in your office you as an intellectual worker were supplied with a computer display backed up by a computer that was alive for you all day and was instantly responsive to every action you have, how much value could you derive from that?" He then showed the audience several breakthroughs from his lab, including the first graphical user interface, the first interactive on-line computer, the first use of text with links (hypertext), and the first computer mouse (made of wood with two wheels, and described in patent papers as an "X-Y position indicator for a display system"). With a live connection to his office some thirty miles away, an audience of about 1,000 computer experts watched a presentation years ahead of its time, as he and his staff edited the same shared document on a video screen. Engelbart's computer lab at SRI was the second link on ARPANET, the precursor to the Internet, and received the first message sent between two nodes. The message, sent from the SDS Sigma 7 computer at UCLA to SRI's SDS 940 computer, was supposed to consist of the word "log", followed by Engelbart's reply of "in", thus spelling the word "log-in". The computer at UCLA crashed after sending only two characters — "lo" — but those letters were instantaneously received at 10:30 PM local time on 29 October 1969 at Engelbart's SRI laboratory, making it arguably the birthplace of the Internet. Engelbart also held numerous patents relating to digital devices and magnetic memory. Engelbart was diagnosed with Alzheimer's disease in 2007, and died in 2013. "Engelbart, inventor of computer mouse, dies at 88", Associated Press published by USA Today, 4 July 2013: "His death of acute kidney failure occurred at his California home after a long battle with Alzheimer's disease, according to one of his daughters, Diana Engelbart Mangan."